More than 50 students earned credit in Spanish during our summer session. ESMS recognized more than 400 students during our Spring Honors Night. Nutrition staff now serves grab-and-go breakfast, drastically increasing the number of students eating breakfast. We increased our high school class offerings from one in 2011 to seven in 2016. ESMS will hold their annual Honors Night on May 6, 2019, at 6:30 at the UGA conference center. The annual sports physical schedule, date, and times. 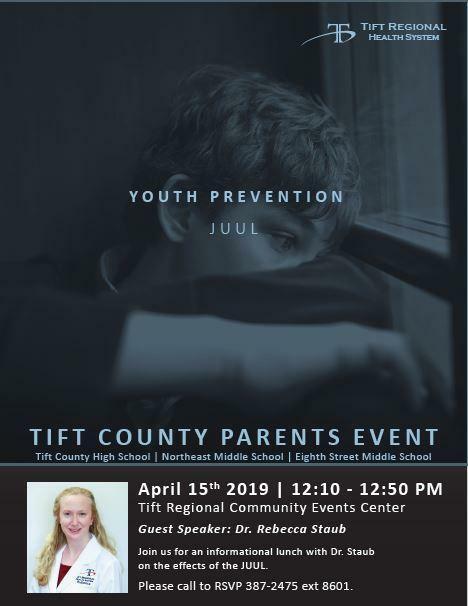 Tift Regional Medical Center is providing a free luncheon event with a speaker discussing the issue of JUUL use by minors and the health repercussions. Please plan to attend, April 15th from 12:10 to 12:50 at the Tift Regional Community Events Center. See flyer for details.